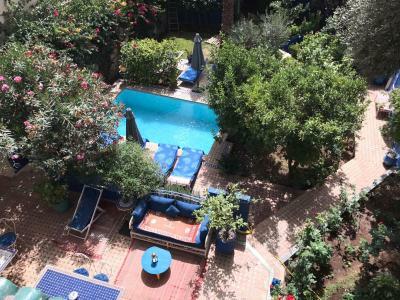 Lock in a great price for Riad Jean Claude – rated 9.5 by recent guests! Gorgeous place, wonderful host, delicious breakfasts, would happily stay there again. Perfect location. The location is good, a parking lot beside quiet and close to the heart of Medina. 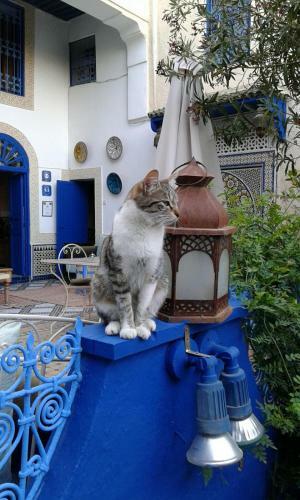 The Riad yard is nice and pretty, I like the blue color, very beautiful. Very cute riad with a great atmosphere. There is a balcony outside the room with a bistro table that overlooks the pool and gardens below. The whole place is decorated with very interesting Moroccan art, rugs, pillows, etc. You can tell the Jean Claude put a lot of time and care into the property. He was an excellent host and helped us book hammam appointments and a car to the airport. 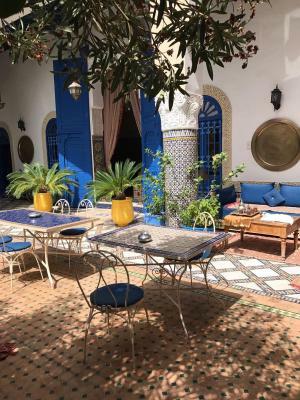 The location of this riad is perfect -- just a few minutes walk to one of the main gates of the medina. It is convenient for taxis because they do not have to go through the small winding streets, so they can drop you right at the front door. The breakfast was also delicious! 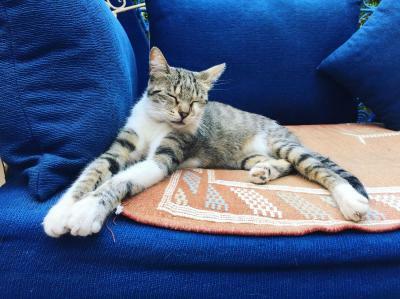 The owner is a very nice French man. He even helped us carry our luggage to the third floor. The garden is beautiful and delicate. Breakfast is delicious. Love everything about the riad. Jean is very kind and helpful. Will definitely recommend the place to others! The location is stellar. Just steps from the medina and a 5 minute walk from the main gate. It is also located off a main road so easily accessible by taxi/car (next to a parking lot too). When it comes to Fes, it can helpful to stay at a place that locals know and that you can be dropped by taxi right at the door thus avoiding the need on foot to wind th the maze of narrow alleys that is the medina. The hosts were accommodating and the breakfast was a good touch. Jean Claude is an amazing host and his Riad is gorgeous. The staff including Wafa is very friendly. It's perfectly located at an entrance of the medina. The place is very clean, includes a pool and garden, good breakfast. It's been such a pleasure to stay there. Beautiful garden and courtyard. Location great on the edge of the Medina. Beautiful, impeccably appointed hotel. Proprietor and staff friendly and attentive. Delicious meals. We parked in the large lot just outside the Medina wall and our GPS took us to the front door in minutes. Great location. 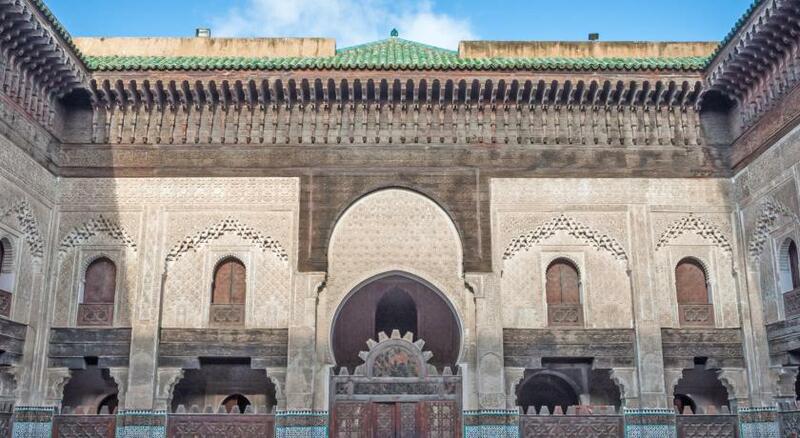 This Riad is located within a 10-minute walk of the Madrasa Bou Inania and the Karaouine Mosque. Built in a traditional design, it offers deck chairs by the outdoor pool, a garden and a furnished rooftop terrace. All rooms with attached bathroom are air-conditioned and offer free Wi-Fi. 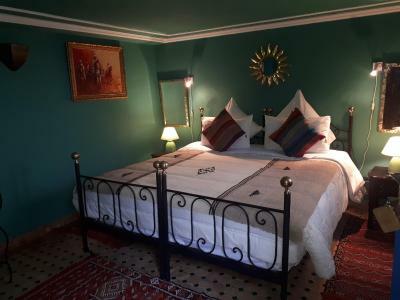 Decorated with traditional Zellige tile work and hand crafted items, each room overlooks the garden or the Medina of Fez. A continental breakfast is provided every morning. 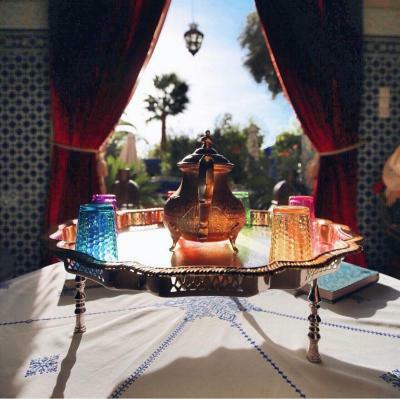 The Riad can prepare local specialties upon demand and serve them on the terraces, in the living room or by the fountain on the patio. Riad Jean Claude is a 5-minute drive from the Tombs of the Merinides and from Dar Batha Museum and Fes Saiss Airport is 12 mi away. Services available at a surcharge include horse riding, henna tattoos and airport transfers. 뀐 Located in the top-rated area in Fez, this property has an excellent location score of 9.8! 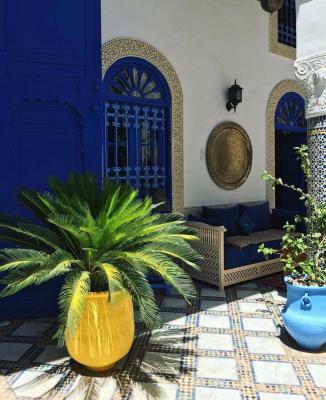 When would you like to stay at Riad Jean Claude? House Rules Riad Jean Claude takes special requests – add in the next step! Please inform Riad Jean Claude of your expected arrival time in advance. You can use the Special Requests box when booking, or contact the property directly using the contact details in your confirmation. An oasis in the perfect location to explore the medina. Riad Jean-Claude was a fantastic place to stay during our visit to Fes. It was all we needed and more. The room was great with a extremely comfortable bed and lavish bathroom and the breakfast laid on each morning by the staff was a real treat that we looked forward to. Jean-Claude was fantastic right from start to finish helping us see everything we aimed to see during our stay. He is such a friendly and welcoming person who went the extra mile to ensure we enjoyed every aspect of our visit. We would recommend a stay with Jean-Claude to everyone who sees our review. You will not be disappointed! When we come back to Fes, we will not look anywhere else to stay but here. The host is really nice and helpful. He gave the detail information about the route and everything before arrival. Showed the room and function when living and help to get taxi when leaving. Every details made one like home. 1. the staff was not efficient, we waited for about thirty minutes for checking in, even I left messege couple of hours in advance to tell the arrival time. One staff couldn't speak English and used translation app to talk with us, very hard to communicate, till the other lady came. 2. The room is small, very narrow for an extra bed, so my son slept in a couch, but it is fine, because we chose the room. But we have to make the bed by ourselves, even I have already told the owner and staff that we need it in advance. 3. Breakfast was good, but no eggs. We felt very cold in the morning, coffee was just warm, not hot enough for such weather and temperature. The heater didn't work, so it is really cold. The Riad was truly traditional with wonderful examples of Moroccan mosaics and artefacts The surrounding gardens with a pool and fresh fruit trees were an added bonus It was in an amazing location with the amazing medina right on your doorstep with all of its amazing aromas Jean Claude is the perfect host and gave great advice on places to visit car hire companies etc Highly recommend!! The water will flood when you take a shower. The beautiful garden,nice decoration in the rooms. The whole atomosphere is very nice. It’s more beautiful than pictures!!! The address is fantastic! Quite close to old street, just by 1 minite walking but outside the chaotic commercial place which is ideal for staying. Car parking place just outside the riad . The whole riad is like a shangrila, beautiful plants and decorations made by Jean! Great breakfast and room service. Jean Claude is a very nice host who took us to the bus station when we're leaving. Definitely highly recommended!!!! I wish the weather had been hotter as I would have spent more time in the pool! The French style breakfast was ample and fresh with yoghurt, fruit, pastries, bread - home made Moroccan and baguette - jams and lovely fresh orange juice. One night, Fatima and jc made us really scrumptious supper. The garden provides a gorgeous retreat and the view from the little terrace outside the rooms is picturesque. The other guests seemed happy and low key, which is nice in a small place. Wow, what a beautiful place! 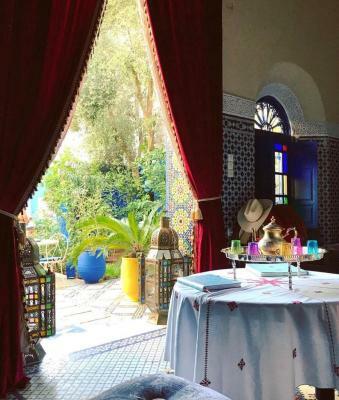 Riad Jean Claude is a paradise only a minutes walk from the medina of fes. The garden is a colourful oasis, the pool was luscious in the late summer heat and we loved the friendly cats! Jean Claude was extremely hospitable and always cheerful. Also a delicious breakfast every morning made by Fatima :-) the room was very comfortable and we had a beautiful terrace too. We would HIGHLY recommend staying here!